How to write an email which gets a better chance of being opened and getting a response. This will increase your chances of hitting your sales target for the month, quarter and year. Email is the most common form of communication in business. Most sales emails don't get replied to because they're not good enough. So how do you improve your email? How do you communicate to a customer and increase the likelihood of them replying? Face to face is important. Social media is important. Email is the most common form of communication in business and if you don't get it right, you will lose out. A suggested approach to developing commercial skills in Business Graduates in the construction industry. Commercial awareness is one of the key attributes cited by many employers as being essential to employability, but unfortunately, one that many people seem unable to demonstrate. It comes up time and time again in job advertisements, discussions between recruiters and on careers guidance websites. But what does 'Commercial Awareness' really mean, and how can you develop it? Oban has helped several clients across various sectors and has learned a few tips and tricks to influence the whole lead generation process: from setting out a strategy based on audience insight to write content and promote it online. This is an opportunity to gain some basic insight into how marketing departments can increase the rate and efficiency in generating leads for sales departments. In 2017, millennials comprised 35% of the UK workforce. By 2020, they are projected to represent an astounding 50% of the total global workforce. They bring wants and needs which differ greatly to previous generations, and hold more bargaining power than ever before in the labour marketplace. With that in mind, companies and business leaders need to be made aware of how to harness that power in their favour. Nazma Qurban, Chief Revenue Officer at Cognism, has built a high-performing sales team that is made up of 98% millennials. In this inspiring and insightful webinar, Nazma will demonstrate how to motivate millennials – by being a mentor, not a manager. Let’s face it… selling isn't easy. Sometimes it seems easier to lure a ravenous lion with a lettuce leaf than hit your monthly sales target. Even the best, most seasoned salespeople will feel pressurized from time to time and result in them not hitting the target. It’s this pressure that spawns excuses – excuses that detract attention away from a salesperson’s performance (or lack of it). I hate hearing excuses; it feels like people are trying to blame others rather than accepting their own failings. But what are the top excuses you’ll hear from a salesperson? Imagine if you knew the formula for outbound success. Attend the Revenue AI: The Science of B2B Sales with James Isilay CEO of Cognism and you will! Learn how you can use a simple formula to improve your outbound B2B marketing and sale. Understanding brain development since caveman times provides the key to influencing others especially given the massive advances in neuroscience over recent years which has taken the art of persuasion beyond psychology into brain chemistry. The Reptilian brain, the Limbic system and the Neo Cortex can be likened to your “Gut”, “Heart” and “Head” brain. These three brains transmit data constantly to each other when we make decisions but if we want sales success we must first understand our own preferences by using behavioural profiling and then diagnose which of these dominates the customers brain to stimulate sales, increase conversion ratios and shorten sales cycles. •Learn why so many training methodologies and programmes are too one dimensional to succeed. Leading yourself or others, it doesn’t matter. At the end of each day, we are all looking for meaning and purpose for what and why we get out of bed every morning. It's an important aspect that impacts our daily lives. As a business and leader, you play an instrumental role in helping your employees finding purpose, and it should start with your business being 'purpose-driven' instead on 'product/solution' driven. Many employees feel that they are just working for a paycheck and aren’t contributing to the greater good of society. Without a sense of purpose, it’s difficult for employees to connect with their work and their company. Working with a sense of purpose boosts employee motivation, productivity, morale, and overall job satisfaction. - What is purpose or meaning? - How do I find it? - How can I help others to find it? - Why should I care? •In fact, according to recent research, most buyers think they could write better proposals than their bidders! Written proposals are a key part of winning business for many sales teams. Yet salespeople often find the process for responding to an RFP frustrating – and clients report being disappointed in the tenders they receive. According to Strategic Proposals’ most recent survey, the majority of buyers think they could write better proposals than their bidders! Join our July 4th webinar with Jon Williams, the managing director of Strategic Proposals, to gain insight into how leading organisations ensure their proposals are the best. Jon will share the latest industry thinking, best practice examples and his top ten tips for maximising your win rate. This #IAM10 High-Performance Teams webinar will help you to build world-class teams that are more motivated, more focused and more productive. Are your teams frazzled, constantly fire-fighting and drowning in day-to-day challenges? Do they struggle to find time to focus on their most important tasks? Does it sometimes feel like Groundhog Day where your people seem to be going through the motions, day after day? Do you feel like a small percentage of your people are on fire and the rest is just smoldering, lacking that important spark of motivation, commitment, and passion? What could you achieve in your business if your teams were more motivated, more focused and more productive? What if you could light the touch paper and stand back and watch them ignite? Attend this webinar for more. Some sales philosophies will tell you that - if you follow a simple formula – customers will never interrupt your presentation with an objection. And - contrary to popular belief - prospects aren’t sitting in darkened rooms trying to invent new fiendish ways to stop you from selling your stuff. Then you need to jump on to this webinar so that I can share with you how to overcome every single objection that you’ll ever hear. Today’s B2B buyers are more savvy and demanding than ever. They want a high quality, personalised and interactive content in real-time that will enable them to make informed buying decisions. Learn how a relatively new discipline, sales enablement, empowers teams with the tools, content, knowledge and skills to boost engagement with buyers resulting in improved returns. Furthermore, understand how digital alignment from CRM to marketing automation and sales tools, is essential for success empowering real-time activity and reporting through AI. - Boost Sales and ROI through a centralised end-to-end platform that aligns Sales and Marketing. - Adopt a buyer-first approach by creating personalised, buyer-driven content in real-time to boost engagements and results. - Reduce cost and drive efficiency with AI-driven search, recommendations and integrated IT infrastructure. Incentives can be a powerful lever to drive sales, but it can be a challenge to get them right. What metrics should we use? Sales? Gross Margin? Should we keep it simple or should we drive better outcomes more elements in a balanced scorecard? How much of the reward should be variable? We think that we are rational about incentives, but actually, we all share some innate biases that could be leading to sub-optimal sales outcomes. Join us for our “Incentives - following the money” webinar to see how you can counter or even take advantage of sales biases to drive better sales performance. You have set yourself an exciting goal. You’ve come up with a solid step-by-step plan of how to achieve it. But you just can’t find the time in your busy schedule to work on it? You’re not alone! In the final installment of Personal Development Essentials, Ruta will show how she managed to find 100+ hours a year of her time for personal development whilst keeping up with her day to day activities. Make sure you find time for what’s important and sign up to this webinar now! Have you set yourself a quality goal and you get the things started, but you’re don’t know where to start? Well then, it sounds like you’re in need of some help building a solid plan! During this second instalment of our Personal Development Essentials, Ruta will talk you through the importance of having a personal development plan and show you how to write an effective and actionable plan that helped her progress from being the most junior sales person in the company with no prior sales experience to one of the Senior Business Development Managers within 4 short years. • Tips on what to do when you feel that you’re not getting anywhere close to achieving your goals or if your goals are not exciting to you anymore. In today’s selling world, Sales Leaders often hit roadblocks, start new roles and need to make an impact and find it harder and harder to make their mark. Ian Moyse has achieved success in firms running large multi-national teams, smaller startup’s needing to ramp and in joining companies needing sales fixing or acceleration and speaks often on fundamental approaches to driving sales growth and performance. If you take one new idea or focus away, it is with your 30 mins to attend this webinar. Have you already failed your New Year’s resolutions? Are you dreading coming into work on Mondays? Are you in need of some motivation to kick-start your goals and finish 2019 with a bang? Then you’re in luck because this webinar is meant for you! Within four short years, Ruta Misiunaite has progressed from being the most junior sales person in the company with no prior sales experience to one of the Senior Business Development Managers at IRI UK, responsible for going after £39m worth of key prospects’ business. The key driver behind Ruta’s success is her relentless focus on continuous personal development and passion for learning everything there is about being a great salesperson. In this first installment of our three-part series on Personal Development Essentials, Ruta will show you how to set quality goals that are challenging, exciting, and help you fall in love with what you do. Don’t wait for a Monday or January 1st to start working on your goals and sign up to this webinar now! This event is designed to give you the opportunity to learn, network, and get the resources to take your teams to the next level. In this two-day event, you'll hear about the latest Zoho solutions, get inspired by the visionary keynotes and the big picture, experience hands-on workshops, and one-on-one sessions, and connect with like-minded peers who also use Zoho to drive their businesses. The Acuity® for Strategic Sales model has been designed by Business Psychologists to enable organisations to develop high performing salespeople and to recruit new sales talent. By reviewing credible research from 30 years of scientific studies into sales behaviours, the Acuity® for Strategic Sales model identifies the 9 key sales capabilities that determine success. 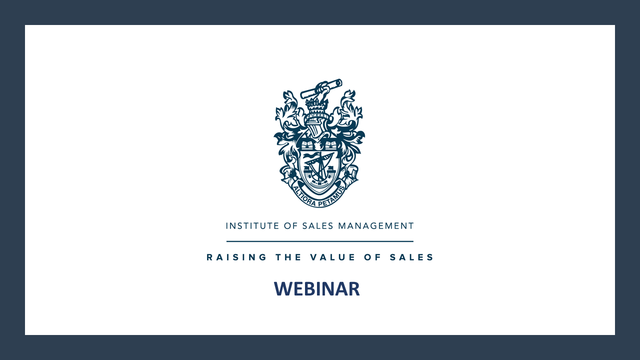 Aimed at Sales Directors and Sales Managers this webinar will share with you how you can measure these sales capabilities in your team to drive sales performance. •Personal Drive- Describes why an individual enjoys sales activities and whether they will seek to perform at a consistently high level. •Sales Focus- Describes what the individual does to understand the client and the relevant economic and industry drivers, to use this knowledge to provide insight and solve customer problems, and to seize opportunities to create momentum in the sale. •Interpersonal Insight- Describes how the individual interacts with the customer, through appreciating the perspective of the other party, modifying their behaviour in a way that is appropriate to the situation and developing relationships and connections internally and externally. Now in its sixth year, the sell-out National Sales Conference (NSC19) is universally regarded as the UK's leading sales event amongst C-level sales orientated professionals. NSC19 offers you the opportunity to be empowered and inspired by key presentations from some of the world’s leading internationally renowned leadership and motivational speakers. Why Companies Invest in their Sales Force? The ISM is a not-for-profit membership organisation representing sales professionals in the UK and internationally. By supporting sales executives, managers and leaders in their careers, and by improving professional sales standards, we benefit our members, their organisations and, ultimately, the wider economy.